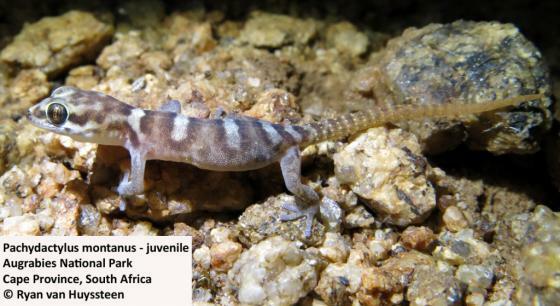 Can you confirm these amateur observations of Pachydactylus montanus? Types Holotype: TM 3080, coll. P.A. Methuen, 17 January 1913). Diagnosis DIAGNOSIS.—A small species, to 43.3 mm SVL. Pachydactylus montanusmay be distinguished from all other members of the P. serval/weberi group by the combination of the following characters: rostral enters nostril; supranasals in variable contact; scales on dorsum of head smooth, flattened to domed, those on snout much larger than those of interorbital region; scales of parietal region granular, homogeneous or with scattered conical tubercles scarcely larger than granules; dorsal scalation variable from nearly homogeneous to moderately heterogeneous, ranging from a few, small granular to flattened tubercles on sacrum, to slightly enlarged scattered tubercles on flanks and sacrum, to 10–12 regularly arranged rows of flattened, conical, or keeled tubercles across dorsum and flanks; toes moderately long with moderately wide pads; typically 5 undivided lamellae beneath digit IVof pes; tail to at least 115% SVL, moderately annulate, bearing whorls of relatively large, pointed, smooth to weakly keeled, well-separated, white to pale yellow tubercles; adult pattern buff, yellowish-brown or pinkish or purplish-gray with relatively large brown spots and/or cross bands, often retaining evidence of juvenile dark band edges; juvenile pattern of four dark-edged light (cream, buff, or yellowish brown) bands: nape, immediately behind axilla, mid-trunk, and presacral. 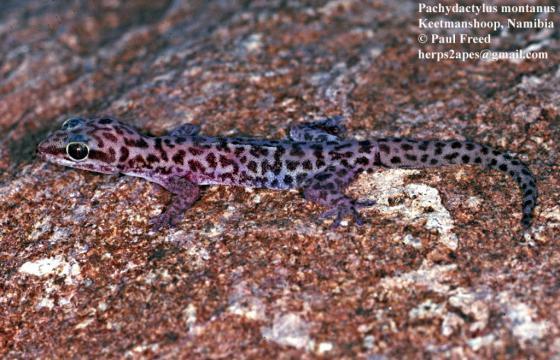 Comment LOVERIDGE 1947 synonymized Pachydactylus montanus and P. m. onscepensis with Pachydactylus serval. with rock crevices (Methuen and Hewitt 1914). 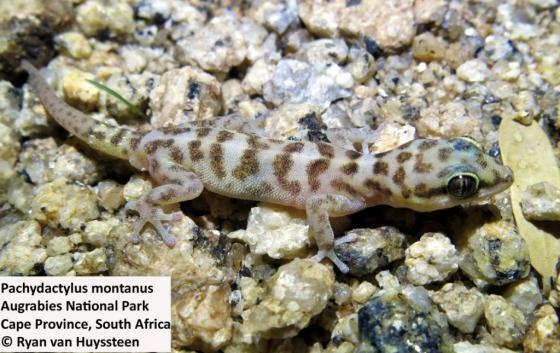 CONSERVATION STATUS.—Pachydactylus montanus occurs in the Ai-Ais/Richtersveld Transfrontier Park. It is locally abundant, especially along the Orange River, but is patchy in its distribution.